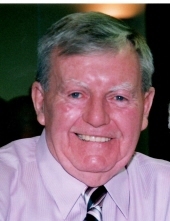 James R. Waters, 81, died Monday at the R.I. hospital. He was the husband of Jacquelyn (Cronan) Waters for 57 years. Born in Providence, he was the son of the late Raymond and Elizabeth (Allison) Waters. He was a long time East Providence resident. Jim worked in data processing in the Traffic Tribunal for the State of Rhode Island for 10 years retiring in 2014. He was a member of the Army Airborne in the Korean War. Besides his wife, he leaves two daughters: Kimberly Thompson and Susan Towne both of East Providence, four grandchildren: Kayla Botham of East Providence, Kristyn (Michael) Haviland of Collingswood, NJ, Amanda Jones (Anthony Rivelli) of Johnston and Jason Thompson of East Providence. He was the brother of the late Kenneth Waters. To send flowers or a remembrance gift to the family of James R. Waters, please visit our Tribute Store. "Email Address" would like to share the life celebration of James R. Waters. Click on the "link" to go to share a favorite memory or leave a condolence message for the family.